If you were unfamiliar with the name Ryan Sieg before the 2019 season, it’s safe to say you now are use to hearing it every week the NASCAR Xfinity Series takes to the track. The Georgia native earned his fifth top-10 finish on in Friday evening’s Toyota Care 250 from Richmond Raceway. The NXS had one lone practice session on Friday morning where Sieg would run 79 laps and finishing the two-hour practice session in the 20th position. 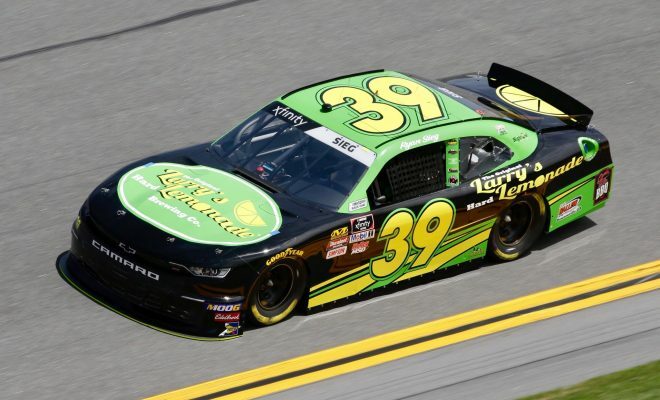 No worries with where Sieg ranked in practice though because his No.39 Larry’s Hard Lemonade Chevrolet showed speed from the drop of the green flag. With qualifying rained out Sieg would start the 250-lap event in the 13th position, but he wouldn’t stay there for long. Sieg’s 17th place stage one finish was the only time he would finish a stage outside of the top-10 running order and that was only because of the way the cars would come in for service. When stage two got underway, Sieg was already running in the 6th position on lap 118 and at one point he was the fastest car on the race track. With a caution for competitor Jeremy Clements in the second stage, Sieg would come in for service on his No.39, coming out of the pits in 7th and restarting in the 14th position with only 13 laps remaining in the stage. With rain a concern, and new tires on his Chevrolet, Sieg was able to gain plenty of track position and finish out the stage in 5th. During the final stage, Sieg was happy with his car when they came to pit road for four tires and fuel, calling for no changes. Restarting in the 7th position, Sieg would gain two more spots to finish the 8th race of the season in 5th. “It was great, the Larry’s Hard Lemonade car was great all night and leaned on a lot on experience, we don’t have all the resources and all the tools and we learned on Shane Wilson, Cowboy and myself to get a good car here and get it dialed in, and it feels like a win for us.” said Sieg after the race. 2019 has been a breakout season for the 31-year old driver and the series is only eight races in. Sieg has 2 top-5’s, and 5 top-10 finishes to go along with an average start of 14.9 and an average finish of 8.6. The next race for Sieg and the NXS will be the Money Lion 300 from Talladega Superspeedway in a couple short weeks. Sieg will look to capture his first Xfinity Series win at the Superspeedway after finishing 6th in the same race one year ago with Alabama Soda & Abrasive Blasting on the car.